There was a monkey living on an apple tree near a pond. The apples were very juicy and sweet. The monkey used to eat them and lived happily. Once, a crocodile swam and came near the tree. 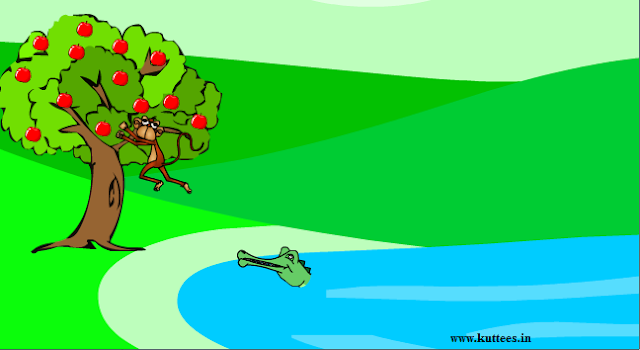 The monkey was very generous and offered some apples to the crocodile to taste. The crocodile ate the apples and thanked the monkey for giving them. Thereafter, it became a routine for the crocodile to get apples from the monkey. They both used to chat for a long time and soon became very good friends. The crocodile used to take some apples to his home for his wife. The crocodile's wife asked him where he got the apples. He told about his friend, the monkey. She thought that the monkey's heart will be very sweet since it eats juicy and sweet apples daily. She was very greedy and asked her husband to bring the monkey's heart to eat. He became angry and disagreed since the monkey was his good friend. But, she somehow convinced him. One day, the crocodile went to the monkey and said that his wife wants to invite it as a guest to his home which is on the other side of the pond and she has prepared good food for it. The monkey was pleased at the invitation and said that it could not swim. The crocodile said that he will take the monkey on his back and the monkey agreed. 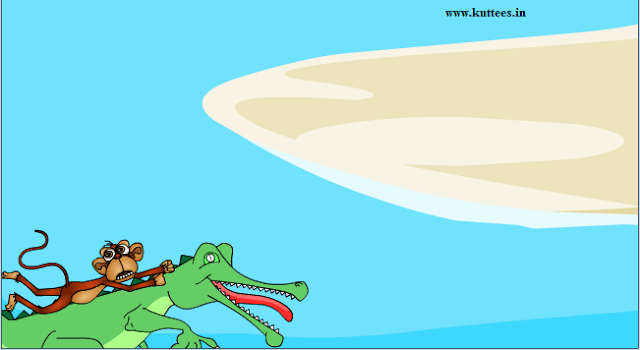 When the monkey was in the middle of the pond, the crocodile revealed his plan to the monkey. The monkey was frightened and thought for a while. The monkey immediately said that it has left it's heart in the hollow of the tree itself and it will be very pleased to give it's heart to his wife. It asked the crocodile to take it back to the tree so that it can give it's heart to his wife. The crocodile was very foolish to believe this and went back to the tree. Once they came near the bank, the monkey jumped up the tree and became safe. The monkey said "Hey !!! My foolish friend !!! You have cheated me. You have lost my trust and friendship. I will never give you fruits from this tree. Go away and don't come back again." MORAL: Intelligent presence of mind always wins.